You are here: Home / Recipes / 30 Minute Meals / Easy Tomato Basil Chicken – One Pot Meal! It seems like the older I get the harder it is to organize my weeknight dinners. I thought I was going to get better at this? 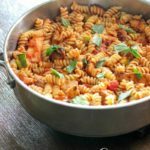 Needless to say, I am sharing one of my favorite recipes that makes dinner and clean up easy with this One Pot Meal of Tomato Basil Chicken. If you are looking for a quick and easy recipe the whole family will enjoy, and one that only takes 30 minutes, keep reading! I love an easy recipe. When life happens and I have failed to plan dinner, this is one of my favorite go-to recipes. I always seem to have pasta and tomato sauce on hand, so that’s always helpful when I have failed to plan dinner. Just add a few strips of chicken and this recipe is a GO. But seriously, this Tomato Basil Chicken is quick and easy, and all done in one pot. If you are looking for a quick and easy recipe to add to your list, this is a favorite. To get started, you will want to cook the pasta according to the instructions. Add in the tomato basil sauce, chopped bell pepper, cooked chicken, and cover. Allow simmering for about 10 to 15 minutes to soften the bell pepper and allow the flavors to marinate together. Add salt and pepper as needed. This is such a quick and easy weeknight meal, and when you forget to plan for dinner because life got in the way, it’s the perfect throw together recipe. 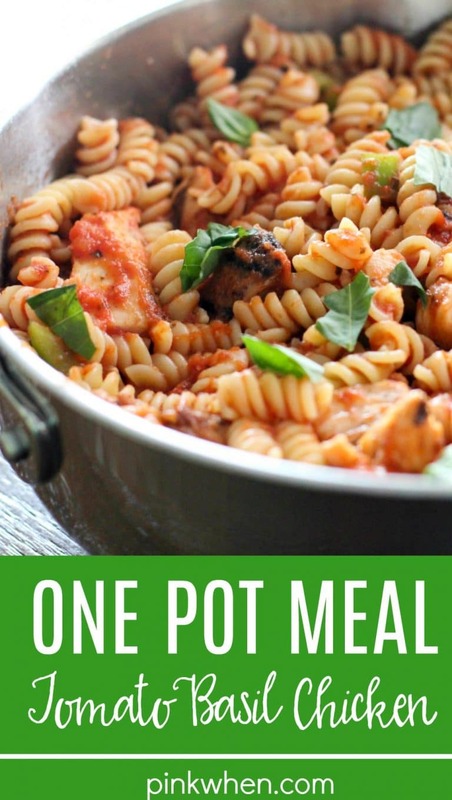 Not to mention, this One Pot meal Chicken Recipe is just plain delicious. 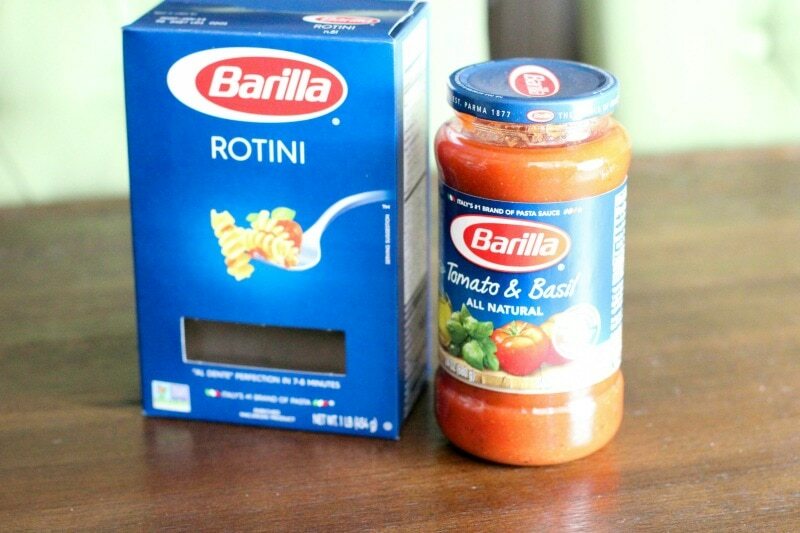 I love to use Barilla because they use simple ingredients, have no preservatives, are gluten-free, kosher, and made with non-GMO ingredients. Leave a comment below and let me know if you love this easy weeknight meal as much as I do. Make sure to PIN it for easy reference later! 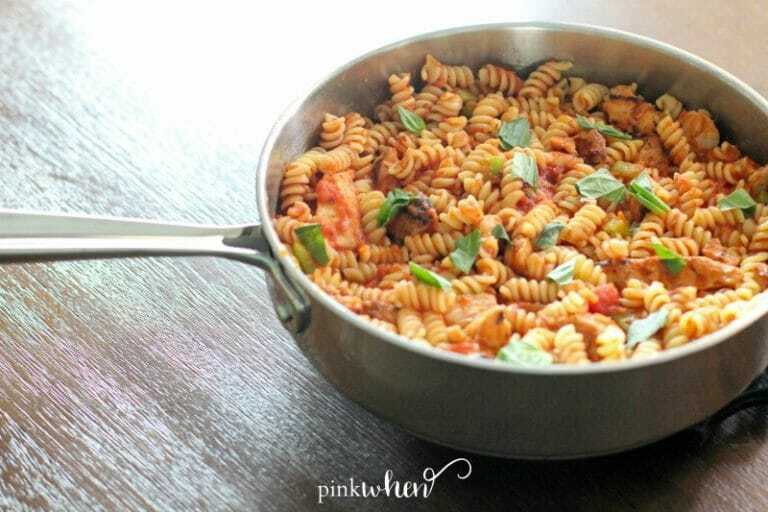 Tomato Basil Chicken One Pot Meal - Only 30 Minutes! A perfect weeknight meal for busy families, this one-pot meal of tomato basil chicken is quick cooking and quick and easy cleanup! Cook the Rotini pasta according to the instructions. Drain. In a medium saucepan, saute´ the bell pepper for 3 minutes in olive oil. 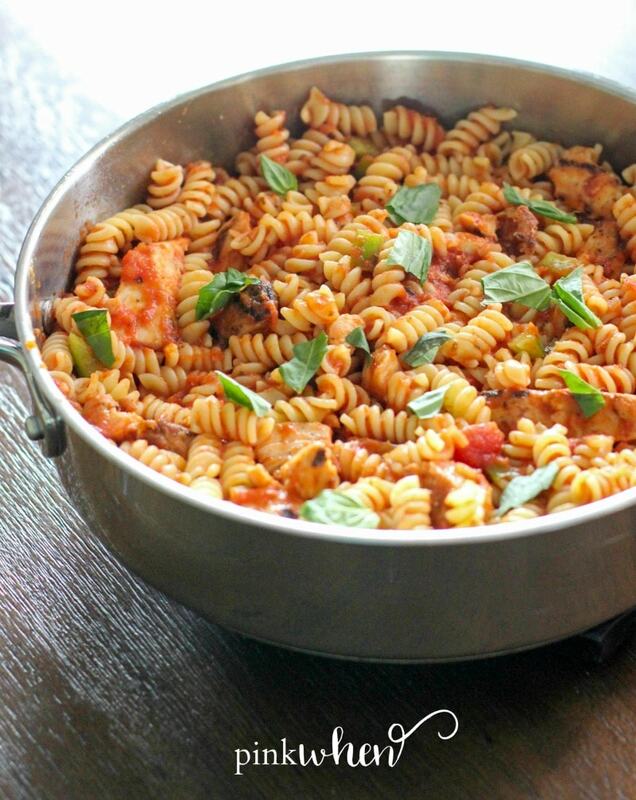 Add in tomato basil sauce, cooked rotini, chopped chicken and cook covered for 10 - 15 minutes. Stir frequently. Remove from heat and top with fresh chopped basil before serving. Add additional time to this recipe if you are not using pre-cooked chicken strips. Keep this recipe for a quick and easy weeknight meal!